Liposuction is a surgical operation that makes it possible to remove, with no evident skin scarring, the excesses of adipose tissue located in some areas of the body, including the abdomen and also the buttocks, thighs, knees, chin, cheeks and neck. The best results are achieved when the adipose tissue to be removed lies in the trochanteric region (upper thigh), on the hips, in the abdomen region, on the internal part of the knee, and in the region under the chin. Even though no kind of liposuction can substitute the advantages of an appropriate diet and physical exercise, liposuction can permanently remove those congenital areas of accumulation of fat that do not respond to traditional weight loss methods. The best candidate for liposuction is the patient with a relatively normal weight and skin that is elastic enough, which has “pockets” of excess fat in certain areas. Liposuction is carried out in day surgery using appropriate anaesthetic techniques specific to each patient’s needs, but almost always in a state of “conscious sedation” (the patient maintains relative consciousness, though being duly sedated with intravenous drugs by the anaesthetist). Liposculpture is an operation by which the fat removed through liposuction is treated and re-injected as a filler in different areas of the body from where it was removed, using it therefore as lipofilling. 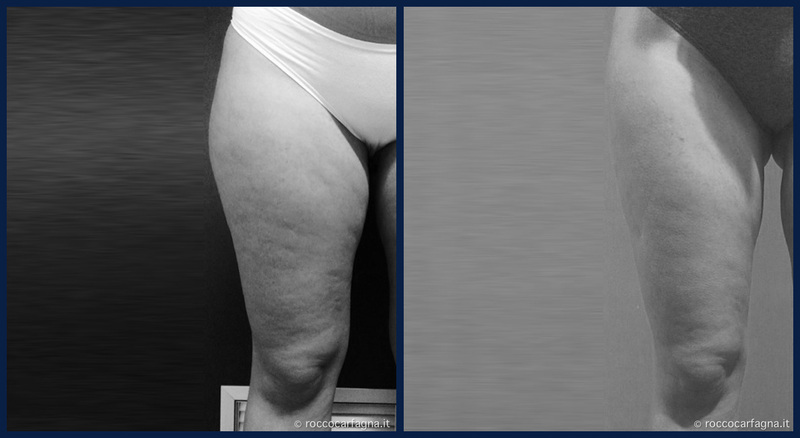 This treatment allows for a more complete body “sculpting” in only one operation. The time required for liposuction may vary considerably, up to even two hours, according to the area, the quantity of fat removed, the type of anaesthetic and the technique used. At the end of the operation, after the small incisions have been closed with sutures or skin plaster (Band-aid), the patient has to wear an elastic garment in order to limit post-operative swelling. The elastic garment must usually be worn for at least 20 days. The patient should normally rest, but after the day after the operation, they can slowly start to do light activities. A couple of days after the operation, the patient can massage the area involved in the operation so as to eliminate any irregularities that may form as the healing process proceeds.